I founded Bursaking.com.my, a platform where I connect with a pool of over 3,800+ retail investors on the subject of stock investing. This is important. You need to know your expected gains to be achieved in a period of time to determine your unique strategy, criteria, and benchmark of success. This, in turn, would determine what stocks to buy and not to buy. Now, if you are still exploring, I’ll share two key examples of what you could be expecting to make from the stock market so that you can decide which of the two is more suitable for you. I intend to make 50% capital gains in 12 months. Let’s say, you have RM 100,000 in capital now. You intend to grow it into an amount of RM 150,000 in one year. Is this possible? What is Your Winning Ratio? How many winning trades are you able to make for every 10 trades? If you make 6 winning trades, then, your winning ratio is 60%. This also means, you have a track record to absorb 4 losing trades out of 10 trades. You are considered to be a profitable trader if the amount you make from the 6 wins exceed the 4 losses incurred. What is Your Risk-Reward Ratio? Traders know how to cut losses. If you buy a stock at RM 1.00, what is your expected reward and expected risk from this trade? Here is a key difference between a pro trader and a speculator. One knows and the other doesn’t. What is Your Set of Trading Skills? Let me list a few here: SMA, EMA, MAC-D, Volume, Trend Lines, Stochastics, DMI, RSI, and Bollinger Bands. The full list will go on and on. These skills are important to boost your risk-reward ratio and winning ratio in stock trading. Again, a key difference between a pro trader and a speculator is: One Knows and the Other Doesn’t. If you have the skills to trade, but, you don’t have the time to trade. It’s still useless as you need to commit time to trade. Basically, stock trading is like self-employment. Intraday trading is similar to having a day job. Swing trading is similar to having a part-time job. If you don’t have the skills to trade and you don’t have the time to pick them up, please don’t trade. Most likely, I would be doing you a big favour as you can save thousands of money from not trading. I intend to make 200% – 300% in capital gains in 10 years. Let’s say, you have RM 100,000 in capital. You intend to grow it to a pretty sum of RM 200,000 – RM 300,000 in 10 years. Is this possible? What is your set of Investing Skills? Your skills are designed to answer 2 basic questions. First, what is a good business? Second, how to get it at the best price? Why? Stock investing involves a simple plan to build wealth via accumulation of profitable stocks that have potential to grow in the future when their prices are reasonably low. I can say, it’s a lot lesser than trading. Wealth from stock investing is based on the company. If the company grows, your wealth increases. Ultimately, it’s not about your smarts. It is about the company. Stock investing is likened to be a business owner whereas traders are more active as thus, likened to be self-employed. Just think of it like buying properties. You buy them and wait for them to grow in value. 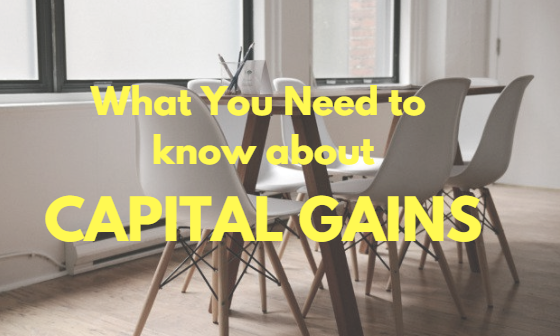 Without knowing your intended X% of capital gains in Y amount of time, it is impossible for you to decide your personal strategies to profit in the stock market efficiently and consistently. Personally, I’m not a trader so I can’t share how to profit from stock trading. Instead, I have learnt and built a kickass money-making stock portfolio that keeps on generating dividends after dividends every quarter, in both good & bad times, rain or shine, good or bad economic condition, or weak or strong Ringgit. It’s about collecting in cash while waiting for capital appreciation to realize by themselves. 1 Response to "So, You want to Achieve Capital Gains …"
Hi. I’m Sam, 27 years old now. I intend to have RM3 million when I turn 40. How should I start with?